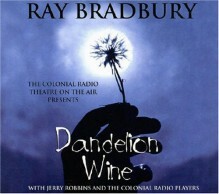 Winner of the Gold Ogle Award for Best Science Fiction/Fantasy Audio Production Ray Bradbury's endearing, lyrical tale of boyhood and an idyllic Midwestern summer *is presented here as a full-cast audio dramatization by The Colonial Theatre on the Air, complete with sound effects and a brilliant music score. Twelve-year-old Douglas Spaulding knows Green Town, Illinois, is as vast and deep as the whole world that lies beyond. For Douglas, summer is a pair of new tennis shoes, the first harvest of dandelions for Grandfather's renowned intoxicant, the distant clang of the trolley bell on a hazy afternoon. But as young Douglas is about to discover, summer can be more than the repetition of established rituals that hold time at bay. It can be a best friend moving away, a human time machine that can transport you back to the Civil War, or a sideshow automaton able to glimpse the bittersweet future.